Climb of Singu Chuli also known as Fluted Peak at 6,501 meters a thrilling adventure In the heart of Annapurna range of mountains with Great Adventure Treks and Expeditions leading you to a scenic trekking trails passing through the warm country of Hindus and to the mid and high hills in the serene forests of rhododendrons, pines and oaks with constant views of Annapurna to Manaslu range of mountains including the beautiful towering peak Mt.Macchhapuchere ( Fish Tail) then entering the sanctuary enclosed with surrounding high peaks of Annapurna I, A South, Huinchuli, Glacier dome, Gangapurna, Tharpu chuli ( Tent peak) Mt. Machapuchhere and Singuchuli the Fluted peak views from the moraines above from Annapurna Base camp. Located near Annapurna Sanctuary, Fluted / Singhuchuli peak is an attractive mountain, part of its ridge line joined to the south with Glacier Dome that includes Singu Chuli. On reaching the Sanctuary near by the lodge at Machapuchhere Base Camp little section of the peak can be seen, cradling the West Annapurna Glacier. From the moraines above the lodges at Annapurna Base Camp the Fluted South Face presents a ‘beautiful shape, buttressed by the pencil shadowy ridges of snow and ice’ rising above the ridge connecting it with Tharpu chuli. 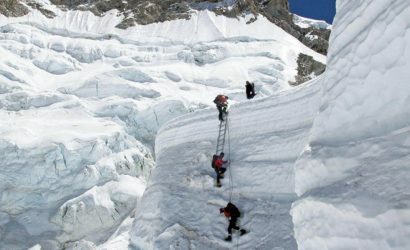 The approach to the ascent route with expert guides of Great Adventure follows a shelf above the west bank of the west Annapurna Glacier, skirting around the base of the mountain’s rocky east ridge to reach the base of the North-East Face, which is unseen, even from the moraines above the Machapuchhere Base Camp. The best distant view of this peak can be seen from Annapurna South base. After an exhilarating climb to the top of Singuchuli / Fluted peak, return journey descending through the lush terraced Modi Khola valley and finally concluding the adventure at Pokhara, a popular destination with its famed Phewa Lake, dominated by the towering mountain range of Annapurna, Dhaulagiri, Manaslu range including the majestic peak Machapuchhere (Fish-Tail) at 6.990 meters, then finally reaching Kathmandu after a wonderful time in the mountains with Great Adventure Treks & Adventure. First received attention in 1956 by Jimmy Roberts when he was exploring the area during a reconnaissance for the 1957 British Machapuchhare Expedition, situated in the Annapurna Himalayan range at the Gandaki Zone it’s location at 28 36 18 Latitude & 83 57 00 Longitude. The above peaks can be seen only from Sanctuary itself, is an attractive mountain; part of the ridge line, thrown south from Glacier Dome that includes and acts as a central divider between the semi-circles of peaks enclosing the Sanctuary. 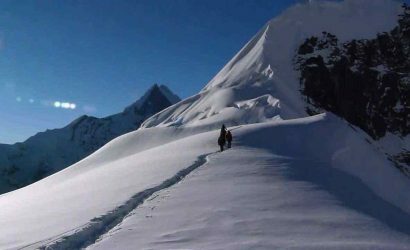 The peak is sometimes confused with Rakhsi Peak, a small summit and viewpoint above the normal high camp. 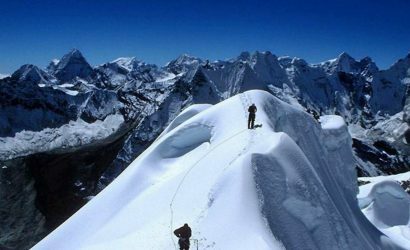 This peak summit offers outstanding view almost all the peaks within the Annapurna range and its Sanctuary. Day 01: Arrive in Kathmandu 1,300m. via respective airlines. Day 05: Trek to Chomrong 1,951m. 5 - 6 hrs. Day 06: Trek to Dovan 2,400m. via Bamboo 2,260m. 5 / 6 hrs. Day 07: Trek to Machhapuchare Base Camp 3,720m. 3 - 4 hrs walk. Day 08: Trek to Annapurna Base Camp 4,095m. 3 - 4 hrs walk. Day 09: Trek to MBC and to Singu Chuli Base Camp 4,300m. 4 - 5 hrs. Day 10: At Base Camp preparation for the climb. Day 11: Trek to Singu Chuli High Camp at 4,900m. 2 - 3 hrs. Day 12: Climb The North East Face of Singu Chuli / Fluted Peak. Day 13: Spare Day for the climb in case of bad weather delay. Day 14: Trek to Himalaya Hotel. Day 15: Trek to Chomrong. Day 16: Trek to Ghandruk1,850 metres. 5 hrs walk. Day 17: Trek to Nayapul and drive back to Pokhara. On arrival at Kathmandu Tribhuvan International Airport you will be received by Great Adventure staff with complimentary transport to respective Hotels, our guide will give you a briefing of Hotel, Kathmandu, Trek & Climbing, do's and don’ts and other related information that you might require while in Nepal with GA.
Day 03: Drive to Pokhara 950m. 5 - 6 hours journey 220 k.m. Morning travel by air or on Coach to Pokhara drives in the busy scenic highway, an interesting drive through the foothills of the Himalaya passing many far villages and towns on reaching Pokhara transfer to Hotel for the overnight stop by the lake Phewa with time for a short walk around. Day 04: Drive to Kande and trek to Landrung / Landruk 1,500m. via Australian Camp or Thulo Kharka 1,500m. 5 - 6 hrs. An hour drive in the morning takes you up the newly built Pokhara-Baglung highway to Kande which is further from Pokhara Valley, where this adventure begins, the 5 hours trek leads on the uphill for an hour towards Australian Camp or Thulo-Kharka in the cool shade of the thin woodlands, on reaching here it is downhill to Pothana with an hour up climb to Deurali from here it is downhill for half hour and on the gradual winding trail to Landruk village with great views of the surrounding landscapes and of Annapurna South. Day 05: Trek to Chomrong 1,951m. approx. 6 hours walks. The trek from Landrung leads to the last teahouse just by the path towards another Phedi of Landrung and Ghandrung, route diverts away from this path following the back of the teahouse and on the farm terraces and finally reaching by the bank of Modi Khola, the route follows the Modi Khola up streams and reaching to Nayapul (New Bridge) a good bridge over the raging Modi River. From here it is more uphill climb all the way Jinwa village, from Jinwa another 1-2 hrs walk leads to a steep uphill till the path joins coming from Gandruk, on reaching wide stone paved path. The walk is gradual with downhill till Chomrong village is reached for the overnight stop. Chomrong village situated in the small valley just beneath the peaks of Annapurna south, this is the last permanent village on route Annapurna sanctuary..
Day 06: Trek to Dovan 2,130m via Bamboo 2,050m approx. 6 hours walk. From Chomrong the trail leads to the terraced farm fields as you descent to the river, after the bridge it's uphill most of the way for 2-3 hours till a small place of Khuldi-ghar is reached, after Khuldi the trail leads down hill for 1-2 hour through the bamboo bushes till you reach Bamboo, a place in the mid of the bamboo, rhododendron and oaks forest with couple of teahouses / lodges. After a brief stop here an hour walk on the gradual uphill path brings you to the overnight halt at Dovan, an isolated spot with 2-3 teahouses, in the midst of the forest near the raging Modi River. Day 07: Trek to Machhapuchare Base Camp 3,720m- 5 - 6 hrs. From Dovan walk continues in the cool shade of the forest with gradual ups' most of the way following the river Modi upstream, the trail meanders with few ups and down as you reach Himalaya Hotel near Hinko cave, located at the bottom of Hiunchuli peak. The trail from here is up for another 1-2 hours to Deurali the last tea-house on route Maccahapuchare Base Camp. On reaching at Deurali the vegetation and tree lines disappears leaving for high alpine flora and shrubs. From Deurali, the trail leads up to follow the raging Modi River upstream, the track is quite pleasant in some places with few strenuous climb for an hour in between as you reach the Maccahapuchare Base Camp for the overnight stop. Machhapuchare base camp has about 4 - 5 Lodges located beneath the towering North Face of Machhapuchare peak. Day 08: Trek to Annapurna Base Camp 4,095m. 3 - 4 hours walk. 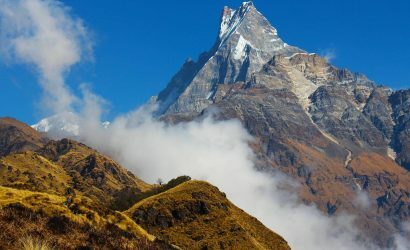 Today's walk leads you in the heart of the Sanctuary at the Annapurna Base Camp, the path follows ascends for few hours on the grassy path, the trek is very pleasant as you reach the higher ground with magnificent view of an array of snow peaks all around you with Annapurna I, a great wall of a mountain on this north west face. Annapurna Base Camp has 2 - 3 teahouses. Day 09: Trek to MBC on route Singu Chuli Base Camp 4,200m. 5 - 6 hrs. From Machhapuchare Base Camp cross the rubble-strewn snout of South Annapurna glacier and then following the Modi Khola on its right bank until it is joined by a tributary stream from the West Annapurna Glacier, the following the North-West route over moraines and grassy meadows to a rock overhang for the overnight camp and the Base Camp for this climb. Day 10: Rest day preparation for the climb. A full rest day to explore around and preparation for this adventurous climb to the summit of Singu Chuli or Fluted Peak. From the Base Camp and beyond the cave, the hill-side above the glacier flattens forming a grassy shelf, from here the climb continues along this shelf to a point where Singu chuli which forms a long, low rock ridge, south-east towards the West Annapurna Glacier, Overnight camp for High Camp is pitched here under this ridge. Day 12: Climb of North East Face of Singu - chuli or Fluted Peak. 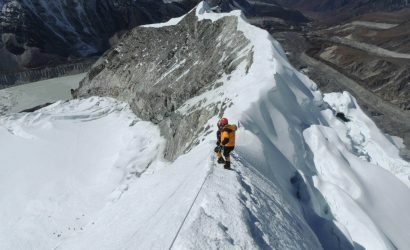 The climb leads to traverse round the skyline ridge, and reaching the plateau beneath the North East Face, from here it leads to a vertical wall of 122m, climbing to skirt a serac barrier leading to a steep step to a shelf which can be climbed easily beneath the gently fluted top section of the face and the upper portion of East Ridge, Then following without difficulty to the summit top, a striking scenery awaits you of all the giant snow capped within its Sanctuary and Mt.Machhapuchare in a mere close distance, after a wonderful time at the top descend back to Base Camp. We have reserved a spare day in case of technical problem or bad weather. If all goes well this spare day can be used on route to Pokhara. Day 14: Trek to Himalaya Hotel 2,900m. 6 hours walk. After a wonderful time retrace the journey back to Himalaya Hotel near Hinko Cave via Machhapuchare Base Camp for the overnight. A good day walk in the tranquility of the mountains and in its tranquil wilderness, the trek leads back to the lush green vegetation; the walk is more or less downhill with few ups to Himalaya Hotel. Day 15: Trek to Chomrong. 4 - 5 hrs. From Himalaya Hotel retrace the journey back to Chomrong by the same path, the morning walk leads to a short climb to Khuldi where you check out in the register. The trail descends all the way to the bridge, from the bridge uphill will to Chomrong. Day 16: Trek to Ghandrung or Ghandruk 1,750m. 5 - 6 hrs walks. From Chomrong, walk leads to a short uphill, descending towards Kimche Khola valley as the trail splits here where the path from Landrung and Kimche Valley joins, the route leads to Kimrong khola valley, the trail branches off from last Tea-house of upper Chomrong, the walk is pleasant on the wide track for an hour till Kimche valley is reached. From Kimche Valley a short gradual path leads to the bottom of the Kimrong danda ridge, the climb takes for an hour towards the Kimrong danda where there are few teahouses / lodges where you can refresh with soft drinks and teas. From here a gentle downhill walk reaches you at Ghandrung village for the overnight stop. Day 17: Trek and drive to Pokhara. 3 - 4 hrs walks with 2 hours drive. The last day walk from Ghandruk leads to a descend on the wide stone paved path passing through farm villages of Kimche till Syali Bazaar is reached, from here the path leads on the gentle winding trail following the River Modi all the way to Nayapul. Few hours of good walk reaching at Bhirethati a charming village. From here cross the bridge over Modi Khola and follow the Modi Khola till Nayapul is reached. On reaching Nayapul board on the Bus for an hour and half drive to Pokhara for the overnight stop after a wonderful time in the tranquility and wilderness up in the mountains with Great Adventure Treks & Expeditions. Day 18: Transfer to Airport for the flight back to Kathmandu. As per the flight time schedule a scenic sweeping half hour flight reaches you back to Kathmandu. A free day in Kathmandu, please inform GA staff if you would like to go on another short tour in and around Kathmandu Valley. Day 20: Transfer to Airport for International departure. Today as per your international flight time, Great Adventure staff will transfer you to the airport for your final departure from this scenic country Nepal. Pokhara is one of the most unique sub-tropical valley in the Himalaya and probably in the world, where one can marvel the beauty of the Himalayan landscape and reflection of the Annapurna massif including the towering majestic peak of Mt. Machapuchhere on its beautiful lakes.. Pokhara is situated in the mid western Nepal. It is linked by the main highway of 200 km driving distance from Kathmandu, and by air approximately 20 to 30 minutes flight with a sweeping panoramic views of the mid east to western Himalayan ranges. Mother Nature has certainly blessed this fertile valley with outstanding scenery of the landscapes, snow capped mountains, moderate tropical climate, and beautiful pristine lakes of Begnas, Rupa and Phewa. The most stunning of Pokhara's sights is the magnificent panorama of the Annapurna range which forms its backdrop. Annapurna massif includes Annapurna I to IV and Annapurna South. Among these high peaks it is the towering majestic Mt. Machapuchhere (Fish Tail) which dominates all others in this range. Pokhara with its natural beauty is also a starting point of Nepal's most popular adventure destinations. 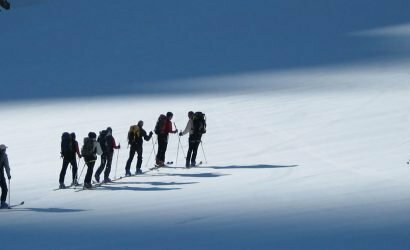 Most of the trekking, mountaineering expeditions begins from this remarkable place and it's an ideal spot for all types of holiday makers.